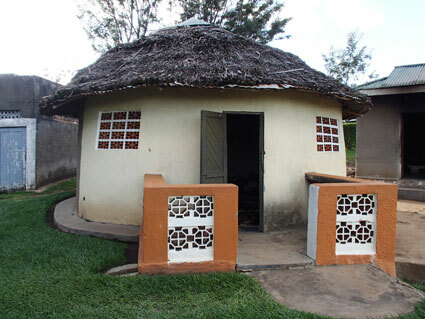 The Ishanyu Homestead is three hours from Kampala and four kilometers from Mbarara municipality. The home sits on a hill with beautiful views. Nearby places of interest include Lake Mburo National Park and other COBATI homesteads. The area is convenient to the highway to Fort Portal and Queen Elizabeth, Rwenzori, Semliki and Kibale National Parks. Your hosts at Ishanyu Homestead are the Katanywa family: Mama Mary, her son Steven, and his family. 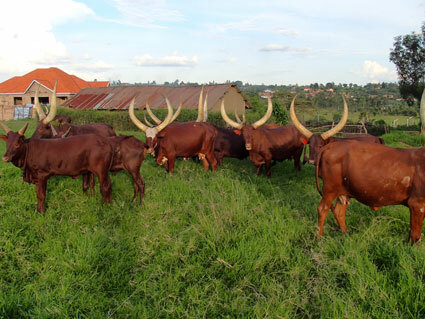 Despite being located in the greater Mbarara Municipality where the once expansive grazing fields are slowly being overtaken by real estate investors, the family retains its farming traditions. The highlight of this homestead visit is the unique traditional hut which houses the milk platform known as orugyegye where the milk pots and accessories are kept. This is the central place of every traditional pastoralist homestead. 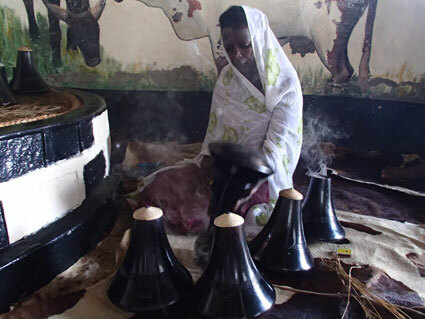 Mama Mary Katanywa, the family matriarch is always at hand to welcome visitors and, through an interpreter, give a lecture on the culture of the Ankole long horned cow. The guest cottage has two guest bedrooms. Notes: The home does not have heat, air conditioning, TV, phone, or Internet. For overnight guests there is a one-time charge for participation in any/all of the homestead activities below. Daytime visitors can schedule selected activities (priced individually); for details, please see the Rates section. Overnight homestay includes three meals per day with beverages. The following prices are for additional items or food and beverage for day visitors. Reservations: Reservations are required 48 hours in advance for overnight and daytime visits. Deposit: No deposit required to hold reservation. Booking fee: There is a $20 per person booking fee. Final payment: Full payment for all services (room, food, activities) is due 48 hours before check in, payable to COBATI by Western Union, Moneygram, Mobile Money, or cash in Uganda Shillings. Payment for any additional items added during stay (food, activities, additional nights) is due in cash (Uganda Shillings) to the host family at check out. Check in / Check out: Times are flexible, to be arranged upon reservation. Cancellation: Reservations may be cancelled up to 48 hours prior to check in with no penalty. For cancellations made less than 48 hours before check in, full payment is due. COBATI retains the right to post photos taken of guests at homesteads on the COBATI website and social media pages.